I hope they are better images. If not, I'll learn to use photobucket. Than you for your precious time. I forgot to tell you that I can see, inside the bowl, next to the man's eyes, two small black dots. 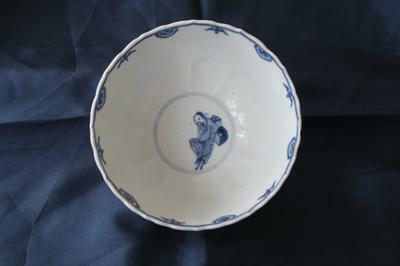 Also,when I visited Major Collections of this site,I saw a smilar bowl in Victoria and Albert Museum,Image reference 2010EC0534, Museum number C922-1910. Stan always provides excellent pictures. Many of the queries in this forum have pictures that are a bit too small, I'm afraid. If your picture is already showing a good resolution where minute details are visible, but is too large, you may have to crop it, in order to show partial pictures instead. Image size is restricted in this forum. Nothing I can do about that. Alternatively, with an external site like Photobucket, Flickr, etc., image size can be much larger than here, allowing to view details if resolution is good. Any site will do where you can upload pictures, including dropbox.com or others. Usually you need to look for the link for public access, as the content is password protected. You would have to post that link here.